It is easily seen from shore and just as easily overlooked , this islet sticking out of the sea 500 yards from the mouth of the Sarno river at Torre Annunziata near Naples. Hercules, they say, upon his return from Spain where he had captured the oxen of Geryon (one of his fabled 12 labours) stopped long enough in the bay of Naples to found the town of Herculaneum and to sculpt this little rock into the seascape simply by tossing it out there. In any event, Pliny the Elder (in book 32 of Historia Naturalis) called it Petra Herculis, The Rock of Hercules, and that is presumably the name the Romans knew it by. Its current name, "Rovigliano," is of uncertain origin. It derives either from a Roman family name (owners of the property at some point) or from the Italian term robiglia, a common plant found in the area. The ruins that one sees are mixed, indeed. As far as I know, there is no real, physical evidence of the Greek temple to Hercules said to have been built on the island, although it would make perfect sense for there to have been such a temple. A bronze statue of Hercules is said to have been found on the island, as well, but if so, it is lost. The rock apparently served the Phoenicians and Greeks as sort of a trading post in their dealings with the peoples who inhabited the interior of the Sarno Valley. There is some later Roman masonry in the ruins, specifically, the brickwork known as opus reticulatum, the masonry technique that used small pyramid shaped blocks of tufa set in a core of cement. The tufa blocks covered the surface, with the pointed end into the cement, so the square bases form a diagonal pattern that resembles a net—hence the name "reticulatum" (from the Latin rete, net) (also see this link). The main bulk of the ruin comes from the fact that a Benedictine monastery arose on the property at an uncertain date in the Middle Ages. As late as the Angevin period in Naples (the 1300s), it was still a very active and well-known monastery. By the mid–1500s, however, the church had abandoned the property in the face of ever more destructive incursions by Saracen pirates. 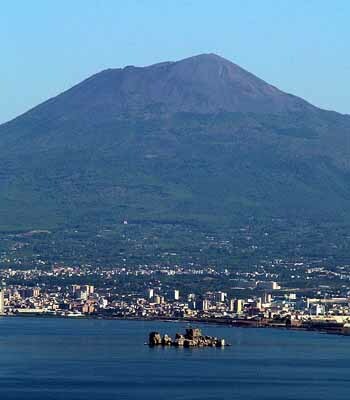 Then, in 1570, the Spanish rulers of Naples converted the rock to one of the many "Saracen Towers"— well–placed and well–fortified watch-towers that served to protect the coastal waters throughout the entire southern half of the Italian peninsula for many centuries. From extant descriptions of the fort when it was finished, it was much more than a simple "tower"; it was a three-tiered "mini-castle," of sorts, taking complete advantage of the considerable monastery structures that already existed on the grounds. As a fort, then, Rovigliano remained important even as late as the Bourbon period and the Napoleonic wars. At the unification of Italy (1860) it was retired from military use and since that time has passed from one private owner to another.